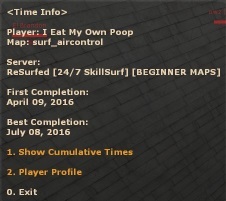 Some of you might recognize me, as I've been surfing pretty regularly on these servers for about five months now, and I'm really enjoying surfing as a whole, so thanks for hosting such great servers. ^_^ I have a couple suggestions involving the menu system. Some of the descriptions for the commands are a bit lackluster, too. 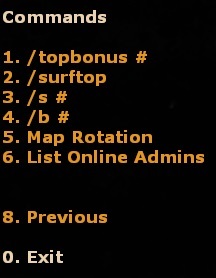 Only /top mentions that you can type "/top mapname" but /pr and /p don't specify that you can also look up other maps/people, or that you can look up another player's record on another map. build - Restrict buildings in TF2. [SM] See console for output. Not only are half of these commands lacking descriptions, most of them don't even do anything or says I lack the access level to use the command. Maybe someone more knowledgeable could fill me in on what this stuff is supposed to do? Preemptive edit: As I'm typing this, I found out there's 11 pages of help console commands that includes the commands that I listed (and more), but I only found this through luck when I was trying different commands. 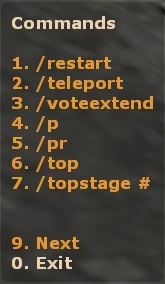 There's a bunch of cool commands that I've never heard of (/options, /recentrecord, /recentrecordbonus, /recentrecordstage) hidden in there that I'm sure people would be interested in knowing! This has probably been suggested before, but it'd be nice to have a quick tutorial on saveloccing. 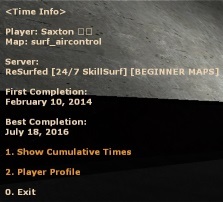 Saveloccing is one of the most efficient ways to learn a new map or practice a certain part of a map, but most new surfers probably aren't aware of it. Granted, most new surfers probably don't need or care about saveloccing, but for those looking to improve, I believe currently the only way of learning about saveloccing is through word of mouth. I found this completely on accident, but I noticed that when you type /top and select a time, you get this time information menu that includes the first completion date and the best completion date. Currently, if you go to your profile (/p) and check your completed maps, selecting a map you completed doesn't do anything. It'd be cool if selecting the map either gave you this information or gave you your personal record information on that map. Speaking of which, if it's still in the database, would it be possible to include the map completion time of the first completion and the map completion time of the best completion? It'd be nifty to compare the two times to see how much you improved. 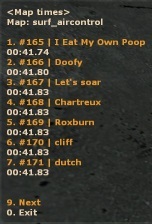 You could also link this in /pr for the map time. Is there a point in including both ! and / commands? Currently, you can type commands using ! or / (!skeys vs. /skeys) with the only difference between the two being that the latter doesn't show up in chat. This is pretty minor/petty, so it's not a big deal, but I'm just curious whether there's a reason to keep the ! commands around. Seems a bit unnecessary when / commands work the same but are less distracting. Sorry for the wall of text! Please let me know what you think of these suggestions!